"Duty-holders in the wake of an incident can no longer take a ‘wait and see’ approach." Personal protective equipment (PPE) use is growing thanks to a combination of improving health and safety (H&S) regulations and shifts in work environments. PPE must be regularly inspected for safety and compliance purposes, but as the amount of equipment grows this can put a strain on administrative resources. At the same time, there is a growing need to be able to demonstrate H&S compliance in the event of an incident. Against this backdrop, large PPE users are finding that traditional, often paper-based methods of records management are insufficient for their needs. This paper discusses how management teams and responsible business owners can now take advantage of smart PPE management systems, and outlines some of the characteristics your system should have. The need for PPE is increasing day by day. In construction, for example, increased urbanisation and a move to taller, metropolitan-area housing and office blocks is increasing the need for working-at-height equipment. A similar trend is seen in the energy sector with the advent of distributed, high-up generation sources such as wind turbines and rooftop solar plants. This means more and more companies are having to deal with larger and larger volumes of PPE and working at height protection. By its nature, this equipment cannot be left to manage itself. Its use is usually governed by regulatory bodies such as the Health and Safety Executive (HSE) in the UK, which are continuously updating and improving requirements to safeguard workers and the public. Being proactive is rarely easy with the systems that most companies currently use for PPE management, however. In recent years, however, the efficiency of PPE management has been greatly increased with the advent of specialist software platforms such as Papertrail. Record keeping on commercially available spreadsheet software, such as Microsoft Excel, is still the norm, and in some cases smaller PPE asset holders may even keep their records on paper. Paper-based records are hard to access and prone to loss and damage, while spreadsheetbased systems entail significant administration effort. These systems use automated remote data entry to create a permanent, one-time, cloud-based record of each PPE item, which can then be updated at any time with inspection records posted on site via a mobile device. 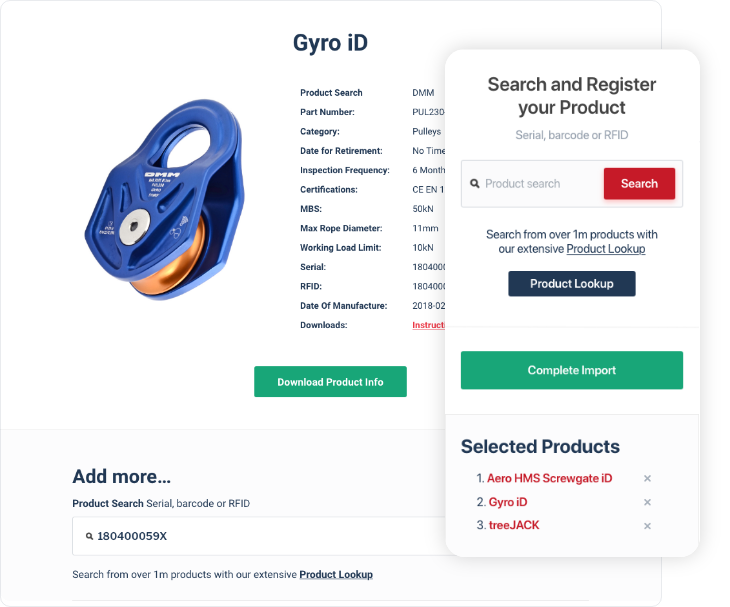 Easy compliance with legal requirements for six-month or annual inspections and an up-todate status of PPE which can be accessed via a dashboard, with records for each item and built-in reporting for major regulations. 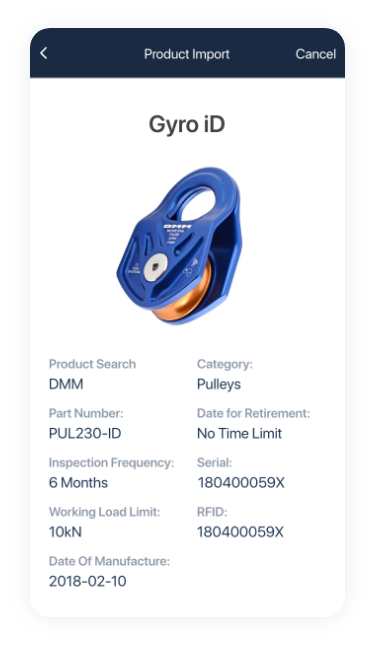 Compatibility with iOS and Android mobile devices and the ability to set notifications to suit any given asset, making it easy to trigger follow-up actions such as repeat inspections or warranty checks. Optional customisable inspection schedules, status reports, certifications, export options, workflows, integrations, task management, checklists and care and maintenance schedules. Easy integration with equipment manufacturers and compatibility with any brand or component with a serial number, barcode or RFID tag. Implementation that does not require any additional hardware and gives you access to the data you need at any time, from the cloud. Customisable configuration and implementation, training, reporting, IT support and additional PPE inspection services. 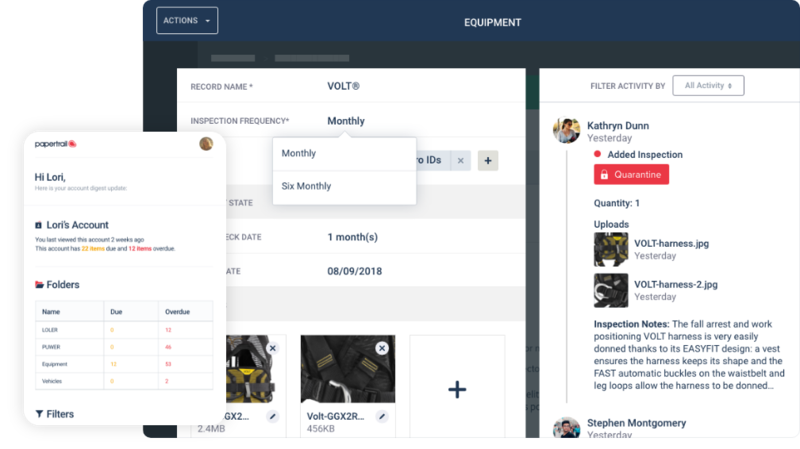 Smart PPE systems also usually can be integrated with manufacturer inventory databases so equipment data can be imported seamlessly and easily. This integration allows equipment owners to create and maintain a ‘digital certificate of ownership’ that registers every significant point in the lifespan of an item, from purchase through to disposal. Such certificates could be invaluable in quality control, for example in helping prevent the sale of fake items or in giving reassurance to buyers of second-hand material. "Gwynt y Môr is the world's second largest wind farm and as such we take compliance and risk extremely seriously. Working with Papertrail we are able to improve our health and safety posture by streamlining processes and information and in parallel, speed up the information flow around wind turbine inspection planning." Users of the Papertrail smart PPE management system have reported more than a 90% reduction in administration workload , along with reduced human error and increased equipment use. Comply with the demands of professional bodies such as the Industrial Rope Access Trade Association and the Society of Professional Rope Access Technicians. Meet standards for UK Lifting Operations Lifting Equipment Regulations, Provision and Use of Work Equipment Regulations and other legal inspections. Cut compliance administration by scheduling automatic reminders for daily, weekly, monthly and annual inspections. Reduce risk for clients and workers by making sure they are not using faulty or out-of-date PPE. Prevent equipment supply bottlenecks by having a complete view of the status of all PPE stock. Extend the lifetime of PPE equipment by ensuring it is reviewed and repaired periodically. Show compliance at any time with a complete service history for each item of PPE. Furthermore, such smart systems are expected to grow in value over time, as they increasingly evolve to receive and manage status data from future generations of connected PPE devices linked to the rise of the Internet of Things. Indeed, over time these smart PPE systems are expected to become the foundation for much broader platforms that can be used for a wide range of applications, from inventory control through to safety compliance. Now is the time to begin investigating their potential. UK Department for Work and Pensions press release, 28 January 2014: Overhaul of guidance to help 10 million working at height. Available at www.gov.uk/government/news/overhaul-of-guidance-to-help-10-million-working-at-height. Markets and Markets press release, 2017: Personal Protective Equipment Market worth 58.34 Billion USD by 2022. Available at www.marketsandmarkets.com/PressReleases/personal-protective-equipment.asp. Sanderson, R, in Safety & Health Practitioner, 31 October 2016: Number of directors prosecuted by HSE trebles in a year. Available at www.shponline.co.uk/number-directors-prosecuted-hse-trebles-year. Sanderson, R, in Safety & Health Practitioner, 14 December 2016: Health and safety experts offer 2017 predictions. Available at www.shponline.co.uk/health-and-safety-experts-offer-2017-predictions. Scholes, B, Papertrail, 10 July 2017: Why your lawyer might want you to get Papertrail. Available at www.papertrail.io/blog/lawyer-might-want-get-papertrail. Papertrail case study, 2017: Helping World Challenge conquer the paper jungle. Available at www.papertrail.io/docs/case-studies/worldchallenge.pdf.